"PROPER PLAYBACK ACHIEVED ONLY AT HIGH VOLUMES"
Image Transfer Review: Although the source video seems to be analog (including a few tracking errors here and there), it doesn't actually effect the program very much. While the quality of the various clips and videos varies, in general, they look fine with no compression or transfer problems. Occasionally, the image gets very grainy or heavily distorted, but it's all part of the source and how the videos were originally made. There are really no complaints here. Audio Transfer Review: Presented in presumably PCM stereo, the audio is about compact disc quality and fits the program well. It isn't perfect; there's some crackles and pops that seem unnatural, but they're only audible at high-volumes or when using headphones. The pure stereo nature of the audio makes it fairly malleable; you can alter it with soundfields or 3D effects to create a suitable, satisfactory environment for yourself. If I have a complaint, it would be that the frequency range seems pretty limited, which brings the grade down. Often, there will be deep bass or low-frequency synths that just come across as distorted and off-pitch, having nothing to do with my speakers—it just doesn't push the sound out very well on some occasions. Extras Review: Though entertaining, 3LUX does have some disappointing aspects. The main reason for this is, on top of not having any supplements at all, the presentation is so bare-minimum, it really effects interaction with the disc. Other than a single menu from which you select one of the three 3LUX volumes, there is no other interface; no menu access to chapters or menu-based track listing. Separating each song seems the logical thing to do, and I'm unsure why the division is so random and chaotic. I also had a few problems with the disc itself. While it may have no bearing on the actual, produced copies of 3LUX DVD Collection, the screener copy I received did not playback properly without a little coaxing. To begin with, the audio seems to be PCM stereo, which would only properly playback in pure PCM mode. Assuming the actual disc is mastered this way, a lot of people might be confused how to get sound from the disc. Occasionally the video would not play properly, as well. The audio was fine, but the video was completely scrambled (and this was not the style of the video, it was a technical issue). Stopping and starting the disc helped, but it was still an occasional issue. I tried different players, and seemed to have the same problems on another, newer model Toshiba, but it played without any problems on my Playstation 2 (with the original drivers), so take that for what it's worth. None of these problems occured at all with 3LUX3, which leads me to suspect a disc-based problem, in which case, the production version will probably have no issues. 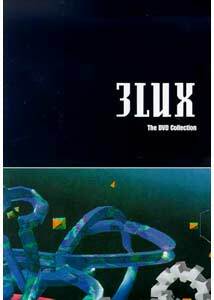 Most places I've seen are selling 3LUX DVD Collection for less than an averageCD, yet you get nearly 4 hours of good music and interesting visuals to accompany it. Inmy opinion, even casual fans of this genre can find a good value in that. It is a nice pieceof work to own, but the minimalist presentation will be the flaw that mars this otherwisegreat music video collection.